What is Brazilian Hair? What is Peruvian Hair? What is Indian Hair? What is the hair Malaysian Hair? As the name implies. What is the difference between these four types of hair, do you know? How much do you know about them? Brazilian hair is the most popular hair type in South Africa.The hair is usually soft,relatively thick and very durable.For this reason,the hair fits any style. KBL of Brazilian hair is very high in quality and over all appearance.They are made of all natural, human hair that adds to the appeal factor.As we alluded to earlier,it has surged in popularity over the years due to the fact that it can be In the four types of hair,the Brazilian hair is a burst of goods,its hair quality is better,good qualitative,flexible,easy to color,cost-effective,high-cost,high-quality,Which 5A Brazil can dye any color. Peruvian hair has become very popular. This hair is very durable and versatile,hair supple and shiny,easy to color,because the hair of Peruvian hair relative to other types of hair is scarce,so the price of a little more expensive in Peru. virgin Peruvian hair has many purpose,it's lightweight but still carries lots of volume.Peruvian hair has soft and silky texture,available in natural black shades.As usual,we only offer 100%virgin Peruhair,is obtained from a single donor and has not been chemically altered or processed.It is shed-free and tangle-free,so you can rest restured that you are purchasing top notch hair.We guarantee that you will love our long lasting and beautiful hair. 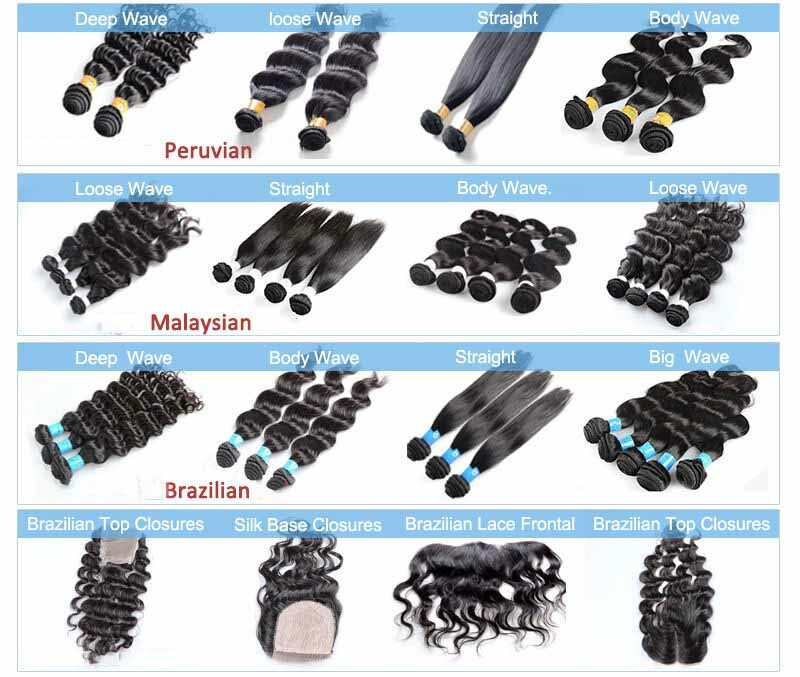 Malaysian hair has become very popular, especially in international and South African celebrities. virgin Malaysia hair is obtained from Malaysian women who sell their to make some extra money. Malaysia hair weave is heavier,thicker and more tense than Indian hair,and also not as shiny and has a fuller body.It has very soft and smooth texture,It is a very good,full, shiny,soft, delicate, easy to color, and more natural after washing.As usual,we only offer 100% virgin Malaysia hair,therefore our Malaysian hair is obtained from a single donor and Has not been chemically altered or processed.It's shed-free and tangle-free. Indian hair is very high quality hair and highly appreciated in the beauty industry. Hair is very light,ventilated,full of bounce and easy style.Indian hair is usually natural and natural wave style,if you want to have a natural hair style,then the Indian hair is a good choice,the Indian hair is also very popular because she is not tangled,but Relative to other types of hair,India hair easier to fall off.